Snob is a pejorative term for a person that believes there is a correlation between social status and human worth. Snob also refers to a person that feels superiority over those from lower social classes, education levels, or other social areas. The word snobbery came into use for the first time in England during the 1820s. A snob is also a tool (an anvil) used by cobblers in the manufacture of footwear. Snobs can through time be found ingratiating themselves with a range of prominent groups – soldiers (Sparta, 400 BC), bishops (Rome, 1500), poets (Weimar, 1815), farmers (China, 1967) – for the primary interests of snobs is distinction, and as its definition changes, so, naturally and immediately, will the objects of the snob's admiration. William Rothwell notes "the simplistic contrast between the 'pure' French of Paris and her 'defective' French of Stratford atte Bowe that would invite disparagement". Snobbery surfaced more strongly as the structure of the society changed, and the bourgeoisie had the possibility to imitate aristocracy. Snobbery appears when elements of culture are perceived as belonging to an aristocracy or elite, and some people (the snobs) feel that the mere adoption of the fashion and tastes of the elite or aristocracy is sufficient to include someone in the elites, upper classes or aristocracy. However, a form of snobbery can be adopted by someone not a part of that group; a pseudo-intellectual, a celebrity worshipper, and a poor person idolizing money and the rich are types of snobs who do not base their snobbery on their personal attributes.Such a snob idolizes and imitates, if possible, the manners, worldview, and lifestyle of a classification of people to which they aspire, but do not belong, and to which they may never belong (wealthy, famous, intellectual, beautiful, etc.). The term "snob" is often misused when describing a "gold-tap owner", i.e. a person who insists on displaying (sometimes non-existent) wealth through conspicuous consumption of luxury goods such as clothes, jewelry, cars etc. Displaying awards or talents in a rude manner, boasting, is a form of snobbery. A popular example of a "snob victim" is the television character Hyacinth Bucket of the BBC comedy series Keeping Up Appearances. William Hazlitt observed, in a culture where deference to class was accepted as a positive and unifying principle, "Fashion is gentility running away from vulgarity, and afraid of being overtaken by it," adding subversively, "It is a sign the two things are not very far apart." The English novelist Bulwer-Lytton remarked in passing, "Ideas travel upwards, manners downwards." It was not the deeply ingrained and fundamentally accepted idea of "one's betters" that has marked snobbery in traditional European and American culture, but "aping one's betters". Snobbery is a defensive expression of social insecurity, flourishing most where an Establishment has become less than secure in the exercise of its traditional prerogatives, and thus it was more an organizing principle for Thackeray's glimpses of British society in the threatening atmosphere of the 1840s than it was of Hazlitt, writing in the comparative social stability of the 1820s. 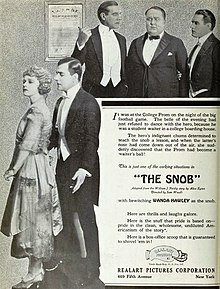 Ad for the American film The Snob, 1921 film with Wanda Hawley and Walter Hiers, on inside front cover of the January 30, 1921 Film Daily. ^ Rothwell, "Stratford Atte Bowe re-visited" The Chaucer Review, 2001. ^ The social historian G.M. Trevelyan referred to the deferential principle in British society as "beneficent snobbery", according to Ray 1955:24. ^ Hazlitt, Conversations with Northcote, quoted in Gordon N. Ray, "Thackeray's 'Book of Snobs'", Nineteenth-Century Fiction 10.1 (June 1955:22-33) p. 25; Ray examines the context of snobbery in contemporaneous society. ^ Bulwer-Lytton, England and the English, noted in Ray 1955:24. Look up snob in Wiktionary, the free dictionary. Joseph Epstein, "In a snob-free zone": "Is there a place where one is outside all snobbish concerns—neither wanting to get in anywhere, nor needing to keep anyone else out?"